Digital voice assistants are into the holiday swing. Companies behind the devices are now starting to fine-tune messaging to fit events. New commands for Google Home were just released, including a command to call Santa. Saying ‘Hey Google, talk to Santa,” triggers a phone call to the North Pole where an elf passes the caller through to Santa, who then interacts with the caller, asking questions about music and various other things. When silent, Santa patiently waits for an answer. Smart speakers can easily be told to play Christmas music. 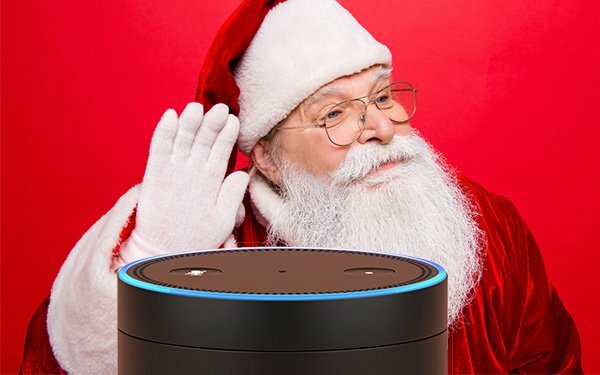 Those with Amazon Prime can just ask Alexa through their Echo Device to ‘play Christmas music.’ Those without a subscription still can get free holiday music by saying ‘Alexa, open Christmas Radio,’ which triggers a music app. It’s not only dedicated smart speakers involved here, with Comcast releasing some new Xfinity Home voice commands. These could have the biggest impact on Santa, since one of the commands is ‘Xfinity Home, show me the living room camera,’ which conceivably could be triggered from the child’s bedroom. Like smart speakers, voice through the Comcast devices also could be used to turn tree lights on and off, change thermostats and activate alarms. While the alarm may be turned off in hopes of a visit by Santa, the chubby bearded one should be most concerned about that instant living room monitoring capability. Chuck Martin is Editor of the AI & IoT Daily at MediaPost and writes the daily Connected Thinking column. He is a NY Times Business bestselling author and his latest book is “Digital Transformation 3.0” (The New Business-to-Consumer Connections of The Internet of Things.) He is CEO of Net Future Institute and a frequent keynote speaker internationally. Follow him on Twitter @chuckmartin and contact him at Chuck@MediaPost.com.